Oldenhammer in Toronto: Painted Miniatures for "War of the Ring"
Painted Miniatures for "War of the Ring"
Here is Citadel's ME-53 "The Mouth of Sauron" (1985), the Lieutenant of the Tower of Barad-dûr. As I mentioned before, I collected and painted miniatures from Citadel's classic range of Lord of the Rings miniatures in order to play Ares Games' War of the Ring. I've never played a game that better captures the flavour of Tolkien's work. Perhaps the best part of it is that while staying true to the essentials of Tolkien, the game give you the freedom to re-shape the events in his trilogy. What if the fellowship avoided Moria? What if Legolas followed Frodo into Mordor? What if Sauron had waited longer to build up his forces before attacking Gondor? Or attacked right away? What if Rivendale had marched to war? Being able to simulate these scenarios within the confines of a coherent and elegant set of rules is a deeply satisfying experience. Often these what-ifs lead to surprising results. When Gandalf avoided Moria, it gave the fellowship the continuing benefit of his leadership... but then the Balrog emerged unscathed from the Misty Mountains and plundered Lorien. When Sauron led a lightning strike attack against Minas Tirith in the early stages of the war, he was able to seize the city... but he galvanized the rest of Gondor into a stiff resistance. I've never seen a board game where story is so central. Strategy, luck, and rules are all important, but they take a supporting role in creating a larger narrative. This emphasis on story makes the game a lot of fun to play solo. It is not at all designed for solitary play -- but I enjoy playing it alone anyway because it gives me a chance to re-imagine the course of The Lord of the Rings. Another element of the game that I have to mention is the artwork by John Howe (a fellow Canadian by the way). 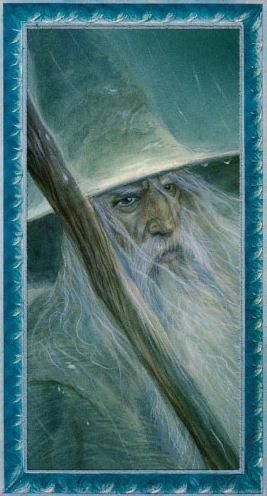 The game designers are to be applauded for getting such an iconic illustrator of Tolkien to paint the card art for the game. Whereas most game companies favour flashy, exaggerated or cartoonish artwork, Ares/Asmodee went in a completely different direction by going with Howe. His stately, elegant and sad paintings set the tone for the game, giving everything a mature air that would surely please Prof. Tolkien. The only thing that needed improvement was the miniatures. I have no complaints about the sculptures themselves, designed as they are by Citadel alumnus Bob Naismith. But they're small and formed in a soft plastic, which makes them poor for detailed painting. Hence my decision to turn to Citadel miniatures from the 1980's (some of which were sculpted by Mr. Naismith back in the day). For example, here's my Treebeard. It's actually the C31 Giant Monster Treeman (1983) later released as "Klinty" from The Tragedy of McDeath scenario pack (1986). 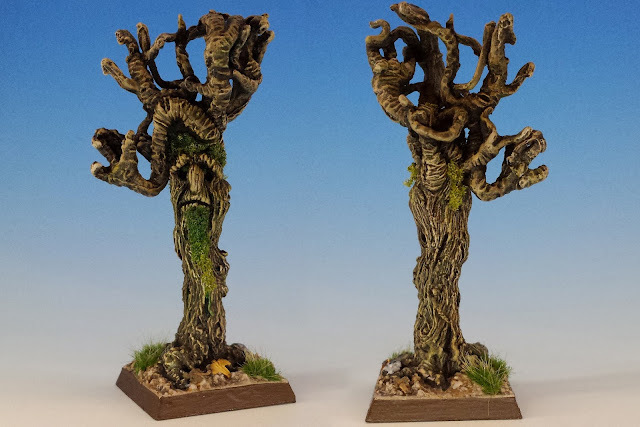 I selected this miniature because I love his gorgeous texture, his tangled branches and his sad eyes. But most importantly, he can fit on a small base, which is terribly important for The War of the Ring, where real estate is at a premium. Next week I'll post the rest of my Lord of the Rings miniatures. Thanks for stopping by! I'm intrigued/confused -- what is misty mountain patrol? Sounds good whatever it is. 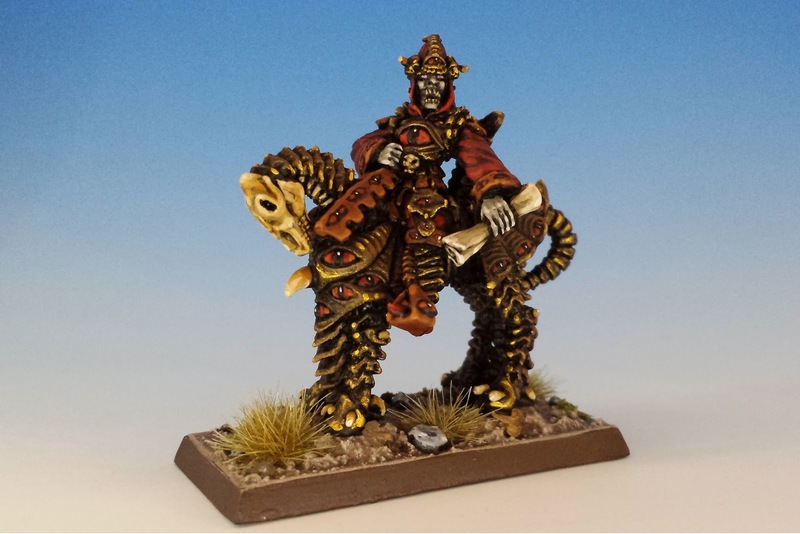 Great warband... you picked perfect miniatures for it. And by the by, your Nazgul is also thoroughly righteous. Love the eyes on the Mouth of sauron fig. What a great sculpt....full of character. Intriguing write up on the game. I want to know more! Maybe you will manage a game AAR some day? I will certainly do an AAR -- thanks for the idea! Gorgeous painting! The eyes on the Mouth of Sauron's armor are stunning and the Treeman is really lovely! Very natural looking. Very impressive! Some kind of magic!Great work! Minis are fantastic! Damn, now I want a copy of this game. It appears to be still in print! A visit to my games store here in Barrie imay be order. I am a late-arriving fan of your blog, BTW. Great inspiration for my own Tolkien gaming projects. Welcome to the blog, Michael! I'm glad to hear that these are giving you some ideas! If you post any pics or posts about your own Tolkien stuff, please let me know. But the idea of using these minis is just outstanding, you are doing such a lovely work! I'd love to see what you've done with the minis from War of the Ring -- have you posted any photos?